The estimated average age of the audience gathered in the futuristic Tempodrom arena in Berlin's western district of Kreuzberg is around 37. They're gathered for a landmark event in rock 'n' roll history: 34 years after it's release, Lou Reed will perform his legendary "Berlin" album in the city which inspired it. When the album was written and recorded, Berlin was divided by its eponymous Wall and struggled with a heroin epidemic amongst teenagers. In other words, it was not a happy place, although it was certainly an interesting one  Berlin, in that era, had become a mecca for some of the most creative heads in rock music. David Bowie, Iggy Pop and Brian Eno found inspiration here for the most interesting chapters of their musical careers. And there are some in the audience tonight who vividly recall the days when Bowie and Iggy shared a flat in the arty West Berlin district of Schoeneberg. Even for many of those too young to have been on the scene, it was these sounds of the 1970s that defined their image of Berlin. "Lou Reed's 'Berlin' record definitely added to the romantic notion I had of the city," says Anthony, a 36-year-old musician from Portland, Oregon, who moved to Berlin four years ago. When Reed finally walks on stage in jeans and a sleeveless khaki-colored T-shirt, he looks  at least from the upper ranks of the auditorium  more like a Gap model than a 65-year old rock 'n' roll legend. He is joined onstage by an orchestra and a girl's choir, while a video-clip of a Berlin bar is projected onto the backrop. The atmosphere is tense; expectations are high. Does Reed still have "it" or has he "lost it", as the character Sick Boy maintains in the movie Trainspotting. Do these songs still resonate in a Berlin that bears little resemblance to the city that inspired them? As Reed intones: "In Berlin, by the Wall, you were five foot ten inches tall," a nearly audible sigh of relief seems to go through the audience. At least his voice has still the same distinctive, warm sound. While the singer shares his tales of depression, drug abuse and disoriented expats, the audience for the most part sits quietly in their seats. The choir and orchestra add a strangely upbeat air to the songs, the bleakness of which had irritated critics when it was released. There is not much movement on stage, except a background singer in a red dress gently rocking back and forth in a chair. One cannot help but wonder, has Berlin become re-unified but boring? A clean, family-entertainment culture, as one man describes the show afterwards, "worse than Las Vegas"? "The old West Berlin scene just doesn´t exist anymore," says 48-year-old Falk, whose long grey hair is covered by a straw hat. "But I don't bemoan the past. 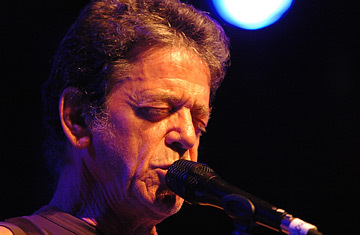 Lou Reed's songs are about issues that are still important today: drugs, disintegration, women losing their children, you still read about it in the papers every day." Only when the band begins to play "Caroline Says II" do Reed and his audience seem to warm up. The highpoint comes towards the end of the show during the inevitable "Walk on the Wild Side." A man sporting a grey beard and a grey suit is dancing blissfully with a beer in his hand. But Reed also manages to thrill the young generation. Twenty-year-old Steffi, wearing a hot pink bob and a red Velvet Underground bag over her shoulder, raves in the foyer: "I was in the front row. I'm still totally euphoric!" For some, at least, he city that inspired the songs of "Berlin" may be lost forever, but the songs themselves have lost none of their power.